Sean Rafferty goes Into the Forest, linking up live with our team in the autumnal forests of New England. Plus live music from mezzo-soprano Kai Rüütel and pianist Cristina Ortiz. 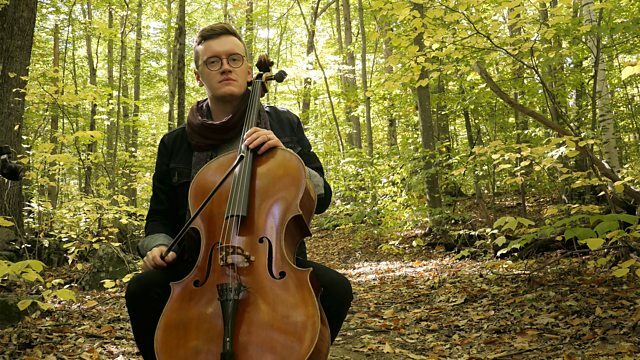 In Tune begins a week featuring daily, live broadcasts from the auburn forests of New Hampshire, USA, as Radio 3 launches the latest instalment of its Into the Forest season. The autumnal transformation of the red leaves of the New England forests is one of the great natural beauties of the world. Working in partnership with BBC2’s Autumnwatch (who are also broadcasting daily from the same forest), each day on In Tune there will be special performances from New England musicians amongst the golden leaves of the forest, as well as contributions from the Autumnwatch team and a daily dose of slow radio moments captured in New Hampshire by the sound recordists of the BBC Natural History unit. And of course, we also have fabulous live music in our London studio, too: today mezzo-soprano Kai Rüütel and pianist Roger Vignoles perform live for us before their recital at the Oxford Lieder Festival on Wednesday, and pianist Cristina Ortiz looks forward to her recital in London's Queen Elizabeth Hall. This week of Into the Forest broadcasts culminates in a special live New England concert in In Tune on Friday (see below). Autumnwatch is on BBC2 Monday to Thursday at 8pm. Into the Forest is a year-long theme for Radio 3, as the station explores the enduring and magical influence of the forest on music and the arts. Choir: His Majestie's Clerkes. Conductor: Paul Hillier. Goostly Psalmes: Ango-American Psalmody from 1550 to 1800. Performer: Kai Rüütel. Performer: Roger Vignoles. Orchestra: Chicago Symphony Orchestra. Conductor: Michael Tilson Thomas. Performer: Michael Collins. Performer: Piers Lane. Orchestra: Bavarian Radio Symphony Orchestra. Conductor: Mariss Jansons. Singer: Magdalena Podkoscielna. Singer: Andreas Post. Singer: Matthias Vieweg. Singer: Ekkehard Abele. Ensemble: Telemannisches Collegium Michaelstein. Conductor: Ludger Rémy. Performer: Itzhak Perlman. Orchestra: Boston Symphony Orchestra. Conductor: Seiji Ozawa. Programmes and features exploring the enchantment, escape and magical danger of forests.